History of the OU » Blog Archive » 50 objects for 50 years. No 24. 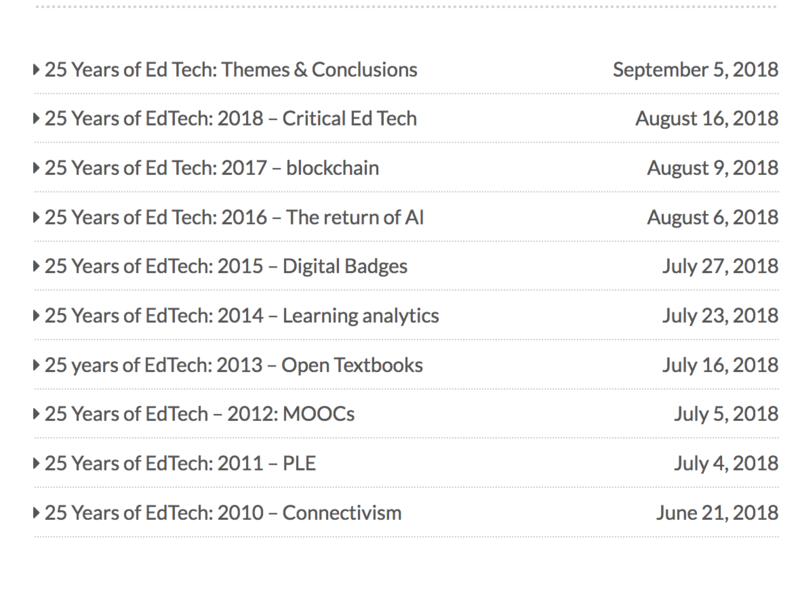 The Ed Techie blog. « 50 objects for 50 years. No 23. The Award ceremony. 50 objects for 50 years. No 24. 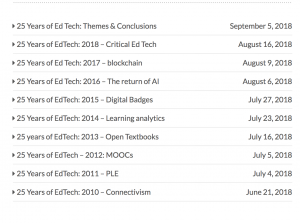 The Ed Techie blog. This week’s object is, like many of the OU’s objects, online. It reminds us that the OU does not only teach students, it also engages in research and encourages dialogue about learning and teaching. The issues that the blog addresses are about how best to support part-time, adult learners, so that they can become critical thinkers, can develop skills in groupwork, communication, reflection and, to use one of the latest buzzwords, can improve their employability. The blog unites readers around discussions that are central to the OU. Many of the OU’s academic staff are physically separated from one another. There are OU offices in the capital cities of the four nations of the UK and some academics are designated a homeworkers. There are many others whose designated workplace is Milton Keynes but whose homes are many miles away. As the OU’s Foundation Chancellor noted, when accepting the Royal Charter in 1969, ‘Milton Keynes ‘is only where the tip of our toe touches ground; the rest of the University will be disembodied and airborne. From the start it will flow all over the United Kingdom.’ The blog captures that sense of a university which flows. It is here that what is understood by Openness at the Open University is assessed, the idea that education is broken is debunked, the notion that education is a system designed for the industrial age and unfit for the post-industrial society, is considered. Perhaps because he offers a mix of the personal, the crowdsourced, the erudite and the witty, that Weller’s online profile is so high. This blog feels like the first place to go to find links to data about whether students who form social bonds are more likely to complete their studies that the socially isolated. Is retention lower for online-only modules than on more traditionally-delivered modules? In a world of abundant content and networked learners what are the merits of constructivism, problem-based learning, resource-based learning? How can we learn from ideas about rhizomatic learning? What have been the best ways to motivate oneself to get out and do some running? There are other blogs available which might have been used to illustrate how the OU is open 24/7 and that engagement is not restricted to those employed at the institution. This blog indicates how, in both form and content, the online dialogue, the linking a range of ideas regarding support for learning, reflects upon and is determined by, the shifting community of scholars who form part of the body of the Open University. This entry was posted on Monday, October 1st, 2018 at 12:01 am by Daniel Weinbren	and is filed under 50 objects, Online teachng and learning, Pedagogy, Research. You can follow any responses to this entry through the RSS 2.0 feed. You can leave a response, or trackback from your own site.